I was just watching the James May's Toy Stories Christmas Special Flight Club*, and in it he commented that the helicopter was making a spiral climb to 8,000'. Why would the pilot spiral, not just essentially go straight up? * An excellent series if you're a big kid who enjoys toys, and as a bunch o' GA pilots, I'd think that covers most of you! A helicopter will achieve its best climb rate at a moderate forward speed. Climbing in a spiral helps to have forward speed in what is essentially a vertical climb. In a hover all the airflow which is available for lift creation must be generated by the rotation of the main rotor. This means that a small amount of air must be accelerated by a lot. If the helicopter adds forward speed, it can achieve a higher mass flow through the rotor, and now less acceleration is needed to achieve the same lift. This improves the efficiency of lift creation. If the helicopter goes faster than its speed for maximum rate of climb, aerodynamic drag grows too high and reduces efficiency again. 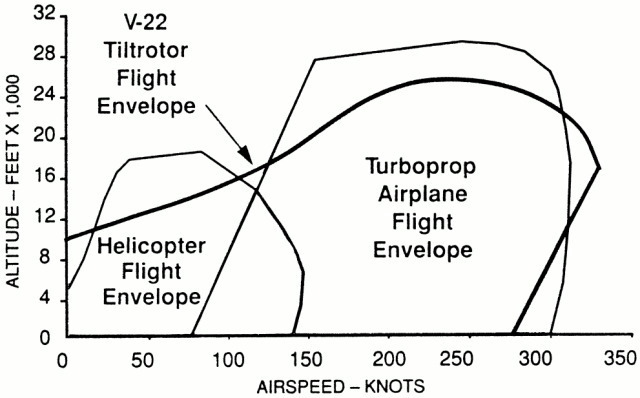 The difference can be dramatic: Below is a plot of the speed versus altitude of a generic helicopter and turboprop plane in comparison to the V-22 tilt rotor. Remember that the available power is roughly proportional to air density, and you can start to see how much more power is available for climbing when the helicopter flies with a moderate forward speed. Flight envelopes of a generic helicopter, a turboprop plane and the V-22 tiltrotor (picture source). Thanks to @mins for inspiring me to expand the answer a little. In the spiral, the helicopter generates translational lift, which is added to the lift generated by the downwash of the rotor system, improving its ability to climb. The reason I performed a spiral climb is for the reasons given above plus a couple more. Forward speed is safety. In the event that the engine should quit, having forward speed gives you a lot more options. When climbing vertically, you have a lot more pitch on the blades than in forward flight. If the engine does quit, the blades will slow down very quickly reducing the time available for the pilot to dump the collective and enter autorotation. You are also storing kinetic energy, as well as potential energy, in the system and therefore have more energy to play with if the donkey does go quiet. In the R22 I was flying, I would probably have about one second to react correctly in a vertical climb. Perhaps 2-2.5 in forward flight. I wanted to remain clear of the danger area since I didn't have a clearance and had limited options for flying around the sides. I did ensure that I was not over any houses and moved the spiral a couple of times so that my noise footprint was not over the same spot. Not the answer you're looking for? Browse other questions tagged helicopter flight-planning or ask your own question. Is a fixed wing more efficient in reaching a certain altitude than rotary wing? What is the difference between Best Rate of Climb and Maximum Rate of Climb? Why Helicopter compulsory need helipad to land? Why would a helicopter hold a 'nose-up' in hover?